The Planet’s Life is in Our Hands… Really? Seriously? If you’re hearing undertones of sarcasm laced with anger and heartbreak in the title of this post, you’re reading me right. I originally had grand intentions of creating an enlightened piece about integral leadership and spiral dynamics… well, not really, but it sounds dazzling. 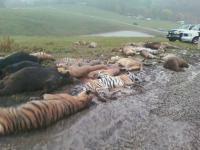 Instead, my attention swayed toward news over the more than 48 exotic animals running loose in Zanesville, Ohio. According to CNN and other news outlets, a man named Terry Thompson caged black bears, grizzly bears, lions, leopards, Bengal tigers, wolves, giraffes, camels, and primates on his 73-acre Zanesville property, east of Columbus, Ohio. Apparently, after re-entry from a one-year federal prison term for weapons charges, Thompson released the animals and then killed himself, according to a report from The Columbus Dispatch. This is a tragic story on all counts. Authorities went out on an aggressive hunt killing 18 tigers, 17 lions, 8 bears, 3 cougars, two wolves, and several other animals—a monkey is still “at large.” Despite the option to use tranquilizers, police chose to shoot these animals at will. I am not convinced all were an immediate threat to human lives. So I have to ask: REALLY? SERIOUSLY? Thompson was convicted on charges of animal cruelty and animals at large in 2005, according to a CNN report. What’s astounding here is not only the lack of regulation to protect animals, but the blatant dismissal of previous animal cruelty convictions and complaints. How does a guy like Thompson acquire permits to collect wild animals? In general people appeared compassionate for the animals. According to an on-going MSNBC survey, 86.3 percent of people believe wild animals belong in the wild, NOT in captivity, while 12.5 percent say that, with proper care and strict regulations, wild animals should be able to be kept in captivity. Clearly, our laws do not reflect this public opinion. “I don’t think there’s anything wrong with properly assessing an animal’s danger before killing it. We, after all, do it for human animals … and even give them nearly unlimited appeals! Aren’t we supposed to be the caretakers of the planet? The point is this is not merely an animal rights issue. It’s a values issue, an environmental issue, an egocentric issue, and a cultural dominance issue. This incident is a gross reflection of our societal norms and underlying assumptions of what is acceptable. My frustration comes from what appears to be our inability to connect the dots—to see the whole of the situation and embody our ecological sense of self. Thompson spent one year in prison for weapons violations. I wonder if after being caged in a federal prison, like an animal, he gained compassion for the innocent animals he held captive, leading him to release the animals subsequent to shooting himself? There is great sadness in this story. To resume my sarcasm, don’t forget to buy your ticket to Ringling Bros. and Barnum & Bailey Circus, which will be performing here in Ohio later this month. You can pay money to watch wild animals perform tricks—beautiful wild animals like the ones murdered this week.